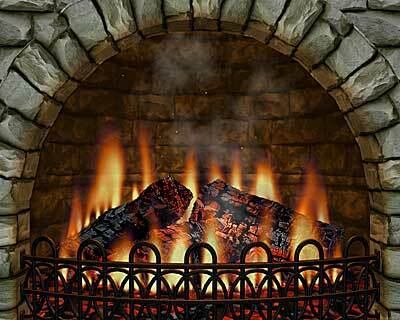 fireplace screen saver,fireplace screensaver,fire screen saver,fire screensaver,3d screen saver,3d screensavernto your Windows Desktop or widescreen TV. It looks better than a real video tape! You can adjust the flame ambience and the types of fireplaces. 3D Realistic Fireplace Screen Saver instantly brings the irresistible charm of an open wood burning fire onto your Windows desktop. You can now have the warmth, ambiance and romance of a fireplace - wherever and whenever you want.It looks better than a real video tape! The 3D accelerated video graphics deliver genuine flame realism and bring the beauty of a wood burning fire onto your computer monitor or widescreen TV.You will hear the sounds of the snap, crackle, and pop of a roaring fire and in the warm glow of the firelight, recreate the atmosphere of those memorable gatherings around the campfire.The screen saver comes with controls that allow you to change adjust the flame ambience from roaring flames to glowing embers to suit any mood.This latest release of screen saver includes burning logs, sparkles, smoke, three fireplace types, three fireguards and seven fireplace materials. Version 3.9.7 adds new fireplace material.